Delkin Devices, Inc., maker of premium quality eFilm memory cards and other innovative digital photography products, introduced its new line of innovative Delkin eFilm Pop-Up Shades. eFilm Pop-Up Shades are LCD screen protective covers, which double as glare guards. These sturdy, lightweight covers are easily installed (and removed), protect a digital camera's expensive LCD screen in the closed position, and pop up to provide easier viewing of the display in bright sunlight. Delkin begins shipping Pop-Up Shades, and the product is now available to the public at www.delkin.com. The first shipments of 11 eFilm Pop-Up Shade models cover the most popular Digital SLR and point and shoot cameras. 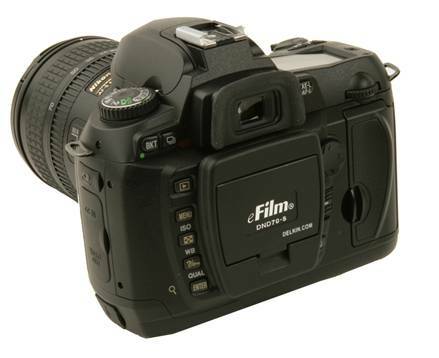 Delkin intends to introduce over 100 models during the next eight weeks, and plans to introduce models for new cameras within 30 days of the camera's introduction. Pop-Up Shades differ from alternatives on the market, being made with hard impact plastic that snaps shut over the camera's LCD screen. Unlike other “one size fits all” LCD hoods on the market that fold or are designed with a bellows look, Pop-Up Shades are designed specifically for every individual camera model. Every Pop-Up shade snaps into place with the flick of a finger to shade the screen from bright light. Research revealed scratched or cracked LCD screens are not rare on recently purchased digital cameras, and the issue is a sore topic of discussion in user groups and forums. Even the top camera brands have this problem. Consumers feel they take reasonable care of their cameras, and are convinced the LCD screens are too vulnerable and should be replaced if cracked or scratched. Manufacturers disagree, and quote up to $200 or more to replace the LCD screen even on an inexpensive model. Result? Lots of unhappy people. Most cameras come with some kind of protective cap, which is often quickly lost because it must be removed to see the camera's LCD. Since most LCD screens are not glass, they are especially vulnerable to scratches or impact force. When closed, the Delkin Pop-Up Shade keeps the screen safe from scratches, dirt, spills, oil from the photographer's hands, and the kind of knocks a camera receives in a camera bag or purse. “The glare guard is what makes Pop-Up Shade a real innovation,” said Wood. “Who hasn't had trouble trying to take a picture in the sunlight because the glare washed out the view on the camera's LCD? Photographers have to move around, maybe lose the optimum angle for a shot, or don't know if they even got a useable image. We decided to offer a solution to both the LCD screen protection and glare in one inexpensive product.” Using the Delkin eFilm Pop-Up Shade is a snap. The cover easily pops up to form a little three sided canopy over the LCD to diminish glare, and folds right back down when you're finished. A camera grade, optically clear glass (itself protected with a clear protective film cover to prevent shipping scratches) continues to guard the LCD screen when the shade is up. The eFilm Pop-Up Shade comes in a creative, one of a kind “try me” package which allows the consumer to open and close the cover while it is still in the unopened package. Three families of Pop-Up Shade are available: Professional, Digital SLR and point and shoot. They are available both in snap on and adhesive models, and come in black or silver to match each camera model's colors. Reseller inquiries are welcome at Delkin Devices, Inc.'s sales department, (800) 637-8087 or (858) 391-1234. “We believe this product will be a big success,” Martin concluded. “Here's a really useful accessory that helps take better pictures faster, is inexpensive, and might save you a hefty repair bill down the road, too. Our eFilm Pop-Up Shade represents the first line of products resulting from our exclusive relationship with a new overseas partner. We look forward to the exciting new products this partnership enables us to bring to market.” The eFilm Pop-Up Shade from Delkin Devices clicks into place on most top-of-the-line professional digital SLR models, often exactly the same way the OEM guard attaches. The MSRP on the Professional models is $44.99. 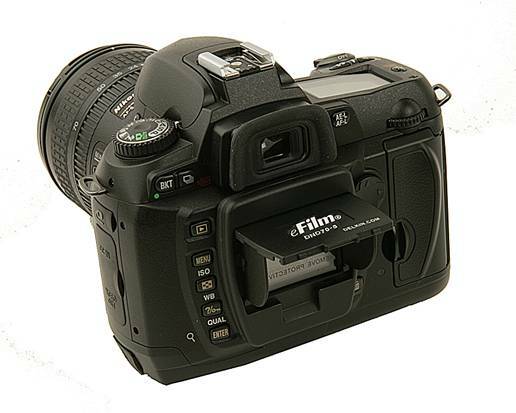 Less expensive snap on and stick on versions for entry level DSLRs are available from $29.99 to $34.99. Delkin also offers stick on Pop-Up Shades with an MSRP of just $24.99 for many popular point and shoot cameras.